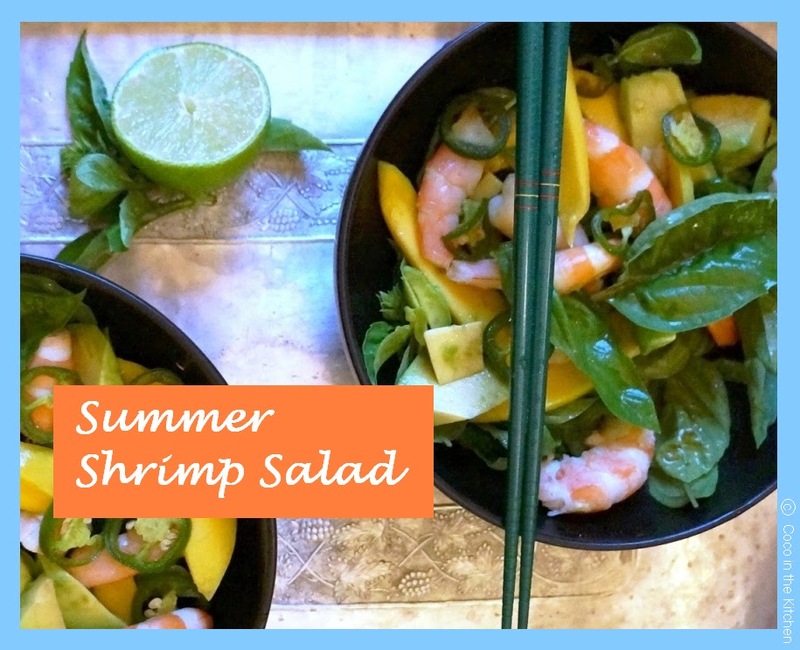 Summer Shrimp Salad and GIVEAWAY Winners Announced!! Congratulations to our giveaway winners BakersSpoon and Mayra Dixon! They say I bake too much. Hey, it makes me happy. But, the last thing you want to do in this heat wave is work the oven. 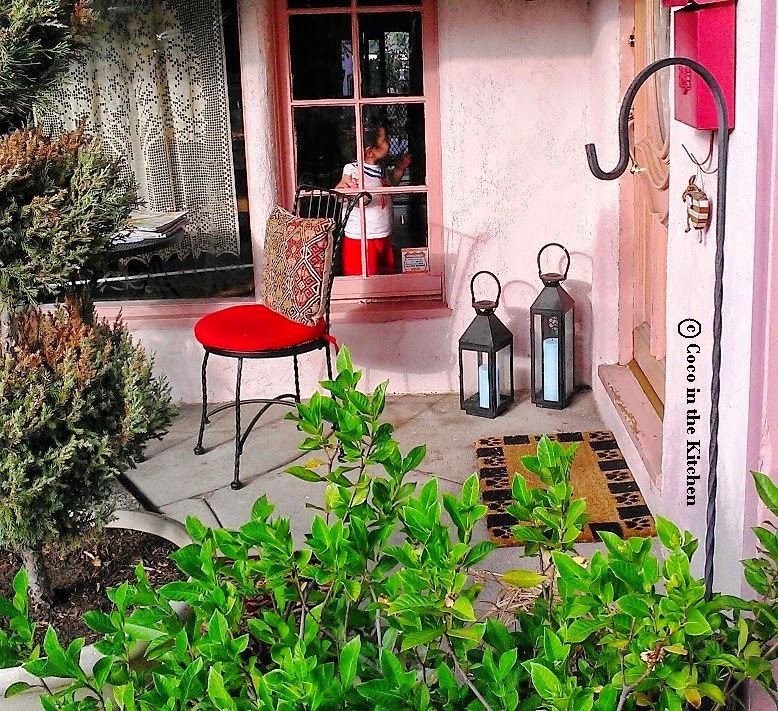 Escaping to our front porch is a better idea on hot summer evenings. We chat about the day’s happenings and catch up with the friendly people walking by. Morning coffee tastes great on that porch, too. When I leave for work, I always turn back, looking for Daisy – sometimes I get a fish-face kiss through the window! When she was a baby, I’d take Daisy outside and we’d settle into my rocking chair. I’d snuggle her in my arms and the cool night air would lull her to sleep. You know, I do some of my best thinking here. When we first moved into our house, we strung a prayer flag across the branches of that old fig tree out back. Legend has it that Buddha himself wrote prayers onto battle flags that later evolved into the colourful prayer flags we have today. The different colours represent the Elements of Nature. Blue is for the sky. 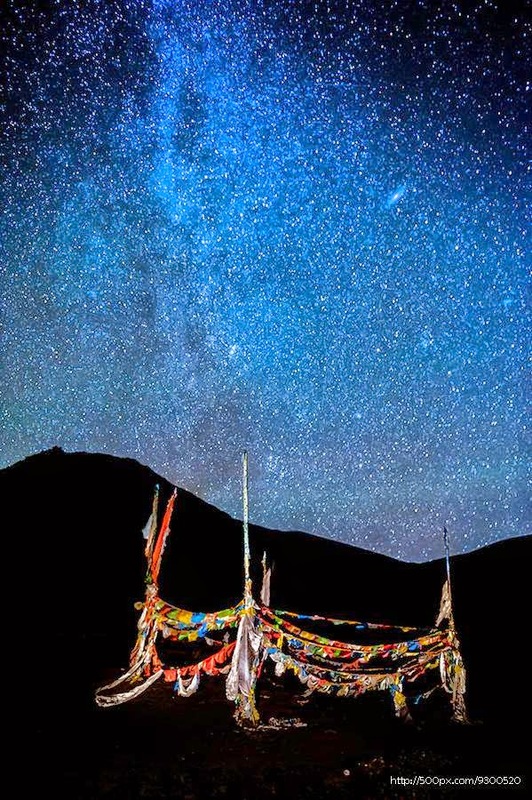 In Tibet, vibrant prayer flags stand boldly against both dusty and icy landscapes. Life is hard in these parts. The Sherpa are hearty people who battle the elements in desolate high altitudes. 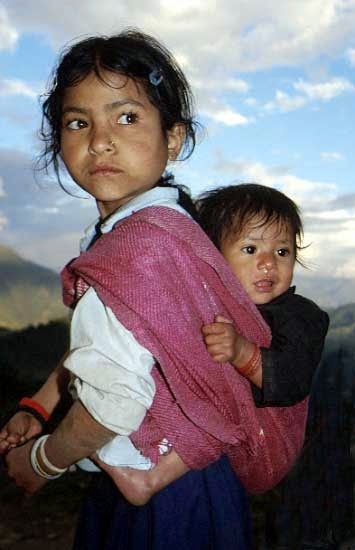 Often, little girls care for younger siblings while their parents work to support the family. Someone gave me my first prayer flag as a gift years ago and told me to hang it in front of my house, so the wind could carry good fortune into my home. Since then, I’ve always had one. Last night, I sat on our front porch quietly, thinking of new ideas for dinner. The thought of a place far, far away landed me in Tibet, then on further to India, where the Dalai Lamai settled in 1959, followed by a wave of Tibetans. Suddenly, I remembered an interesting salad I used to make years ago. One of the first things I made in my early days in the kitchen was actually something that had little, if any, cooking required. 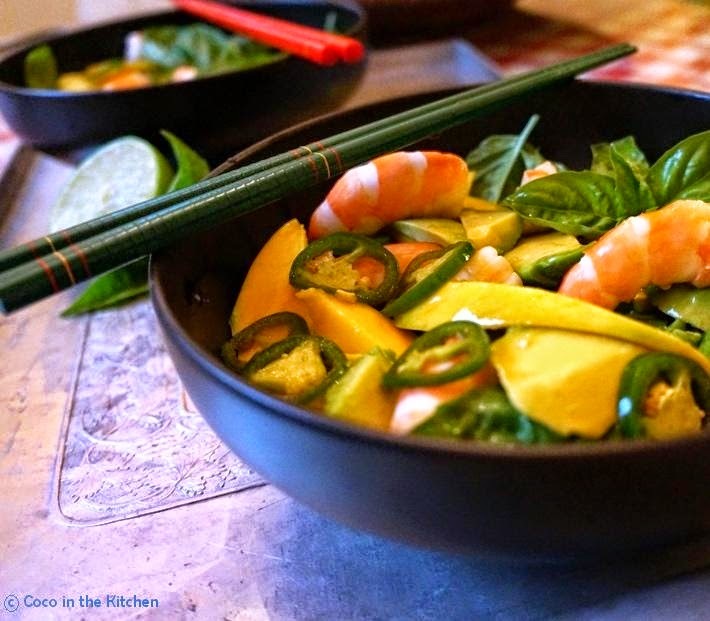 The vibrant colours of the fruit, crisp flavour of the shrimp with a hint of curry make a refreshing dinner on hot summer nights. It’s been years since I’ve made it and my sister still remembers how delicious it is. Are you going to the grocery store today? Add mangoes to your shopping list. The green-red oblong ones called Kents have a sweet-tart flavour and chewy texture. It’s spicy, cool, crispy, salty, buttery, refreshing all at the same time. 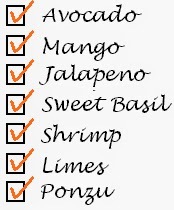 Trader Joe’s has a great selection of various types of shrimp, different sizes, both cooked and raw. The jumbo cooked ones are best for this salad, because you have very little to do. Just take them out of the freezer and thaw for a few minutes in cold water. If you can’t find the ready-cooked bunch, get the raw. They cook up in no time! to chill them thoroughly for this refreshing salad. Remove shrimp from packaging and thaw them in cold water while you prepare the salad. Wash and rinse the basil. Cut the jalapeno peppers into thin slices and add to a large bowl. Grate the zest and squeeze the juice of the lime. Add both to the peppers. Add the Ponzu and curry powder. and lay over the marinating jalapenos. slice into strips and add to the bowl. Rinse the shrimp and toss with the ingredients in the bowl. Divide among four plates or bowls, sprinkle basil leaves on top and serve. It’s true, I do have a raging sweet tooth. But, I adore savory foods, too. Salads are the best things to eat in the summertime. With all the fresh fruits and vegetables everywhere now, it’s easy to get creative. That old prayer flag in our fig tree brought to mind tropical flavours that came to life in this simple salad. It’s the bounty I imagine the Tibetans enjoyed in their new home of India. I’m sending some good wishes your way by offering a Tibetan prayer flag to TWO lucky readers! Winners will be selected randomly on August 30st. 1-All Facebook fans are automatically entered in giveaways. 2-Enter a comment below, telling me what you think the flag would inspire you to make. 3- Post to my Facebook page about this salad. It’s a wonderful time of year. Look around you for inspiration and see what you can cook up. I appreciated knowing what the colors of the prayer flag stand for – didn't know, although I do have one in my garden. I love it so. Can't think of what I would cook – maybe a yellow pepper marinara w/green pasta and white beans…can't figure out the blue- sea veg comes to mind but I'm not sure if it would work. I'm vegan and love the challenge. 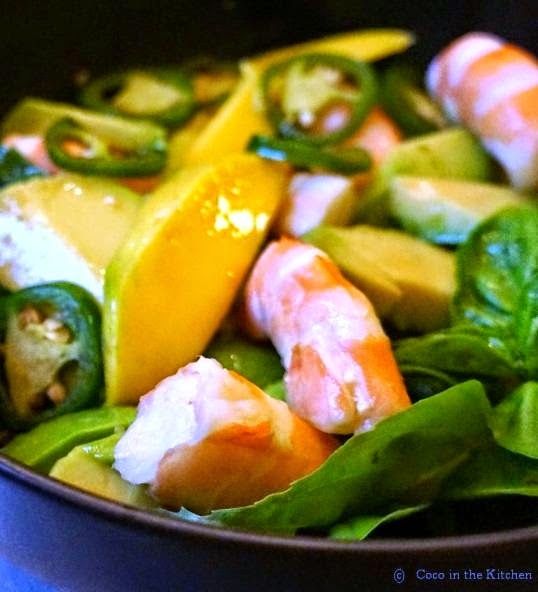 wow — gorgeous, gorgeous shrimp and mango. and so delicious together! love knowing about the flat, and I want to hang out with my coffee on your cute porch! I love your recipe idea. Let me know if you make it and how it turns out! What a great wedding present! I hadn't thought of that, D.
Colette, this looks like a wonderful summer sald that awakes all the taste buds – it has many different fresh flavors – just perfect for this time of your – love all the colors too. 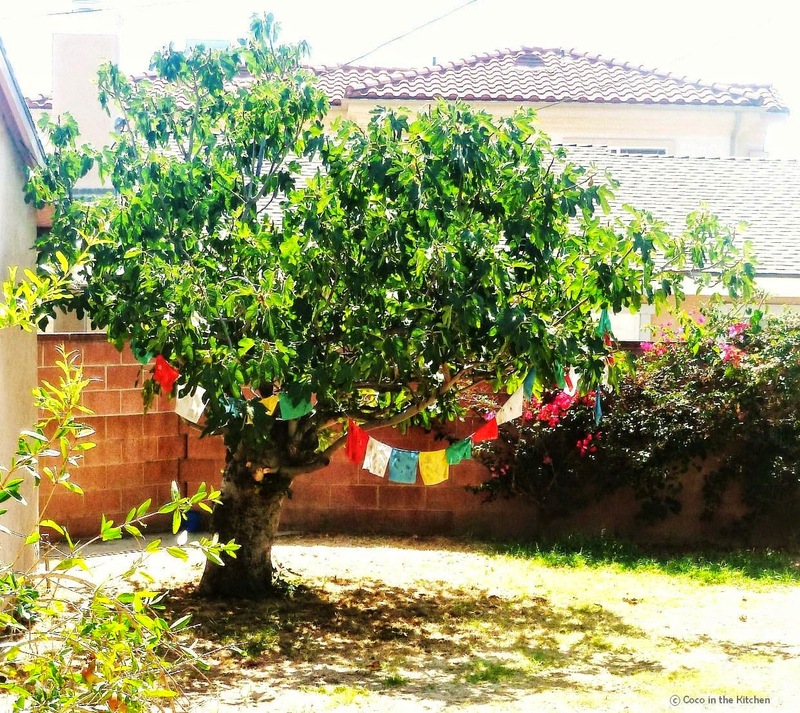 And the story about the Tibetan prayer flag in your fig tree is quite inspiring too! Nice post, Colette! 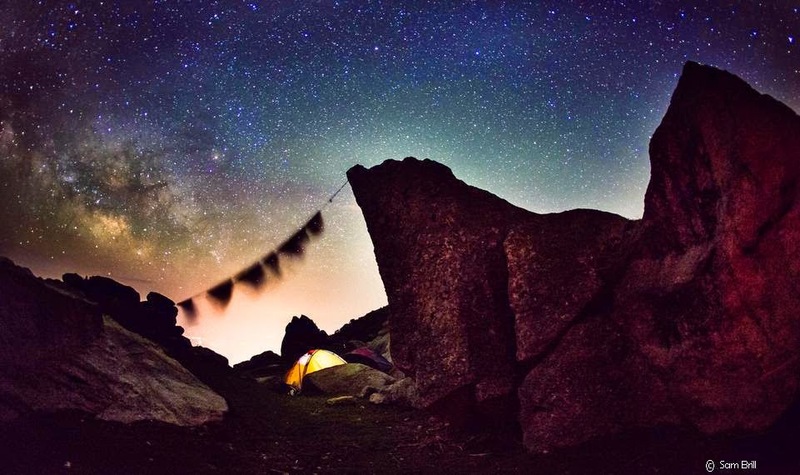 Very interesting post about the Tibetan prayer flag. And a wonderfully delicious looking salad! This is my first time here, but I’ll be back. Lovely blog! The shrimp salad looks like the perfect dinner, my belly is super hungry for it now! Andrea doll, you're gonna love this one! Thanks for stopping by, Kathy! Glad you like my rants and hope you try a recipe or two. Nice to meet you, Kumar. The thing that intrigues me most is the flag's origin. It's a great dinner idea, Pamela, especially for an avid gardener like yourself. Soni doll, I could eat the whole bowl, too and not feel guilty! Thanks, KP. Great to meet you. Your mango cake looks decadent. Oh that salad sounds so good! We eat so much shrimp here on cape cod and are always looking for new ways to eat it! So nice of you to organize this giveaway. These prayer flags remind me peace and happiness. I'm thinking of cooking and eating anything basic like a bowl of steamed rice. I reckon that basic things are great to make me appreciate lots of peaceful feeling for the inner me. Hiya, Emma! Thanks for checking in. Momos sound lovely – you should do a post and talk about your time in India. Would make for some great reading. Zoe, keep warm by baking while you can! Forgot we have the opposite seasons. Remember this salad for when your weather warms up. Ooo – good question! I think I'd pull inspiration from the colors and make something with lots of fresh fruits and vegetables – good for the soul! 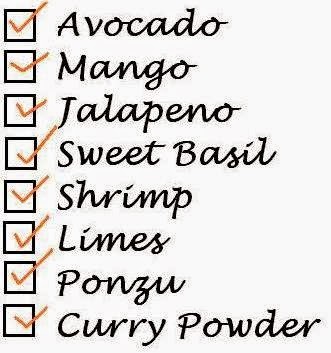 i am going to have to try that shrimp salad. looks delicious! i didn't know about the color meanings in prayer flags. thanks for sharing that! Hi, Cathleen. Thanks for finding me. Great article. I guess we should keep baking then! My kind of salad. Love the prayer flags. I think they and the pictures are beautiful.